However, a professional insurance adjuster does not believe the insurance companies in the Virgin Islands are necessarily out to cheat anyone, and stated that the problem lies in many persons not understanding what their insurance entailed from the beginning and that in many cases properties were not insured for the proper value. "I don't belive that anyone is out to put the screws to the people of the Virgin Islands. I think the people of the Virgin Islands are caught in the middle of a problem that they do not understand or know how to deal with it. 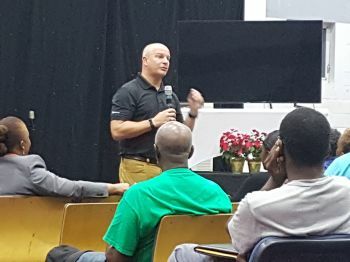 The biggest part of that is this issue of how to insure my property for the proper value," said Mr Michael A. Fusco, Chief Executive Officer of World Claim, an organisation dedicated to helping residents, where they operate, to address insurance claim procedures with knowledge that may change the outcome of insurance claims that are presented. Mr Fusco, who has been in the insurance business for more than two decades, was speaking at a forum organised by social commentator and former Managing Director of the BVI Ports Authority (BVIPA) Mr Claude O. Skelton-Cline at the Save the Seed Energy Centre's Basketball Court, in Duffs Bottom, on the main island of Tortola on Tuesday, December 19, 2017. The aim of the forum, which came at no cost to residents, was to allow persons who have yet to settle and accept the proposed amount of money, to ask questions and get answers to better position themselves during the sometimes difficult insurance conversations. 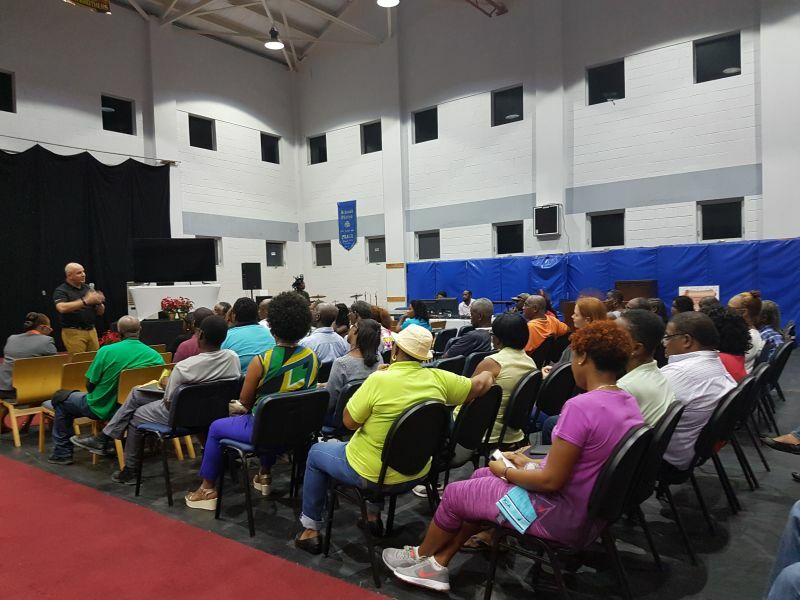 Just over 40 persons attended the meeting, which saw property owners sharing their experience with the insurance companies. One of the main complaints of persons with insurance is that their properties were found to be under-insured following the recent natural disasters to hit the Territory, giving rise to suspicians of being cheated by the insurance companies. Mr Fusco believes; however, that this may not necessarily be the case and that some property owners were under-insured from the time they bought insurance. "I am saying that the math says they are underinsured and they were under informed when they purchased their insurance. Had they known differently they would have made a different choice I believe." 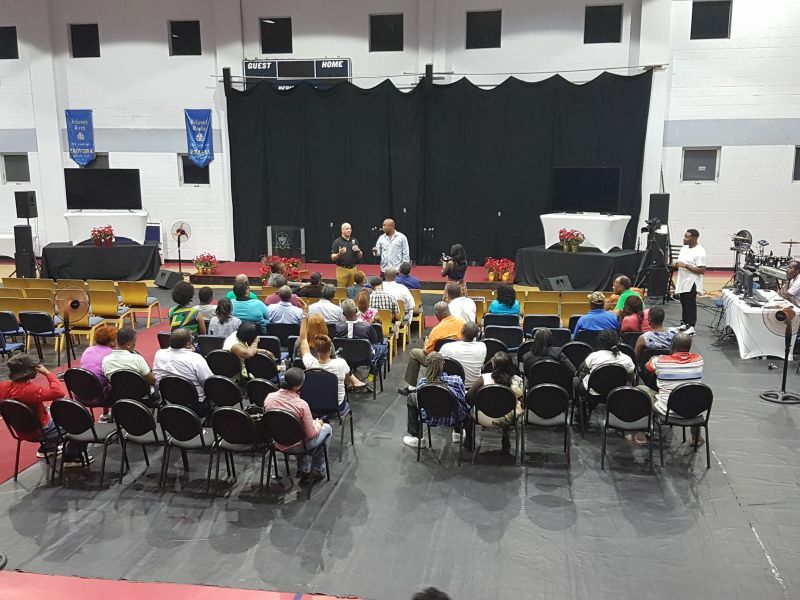 Mr Fucso said too that many persons are not familiar with how insurance works and this would have worked against them. He recommened to those persons to take ownership of the problem and take on a good negotiator to help. 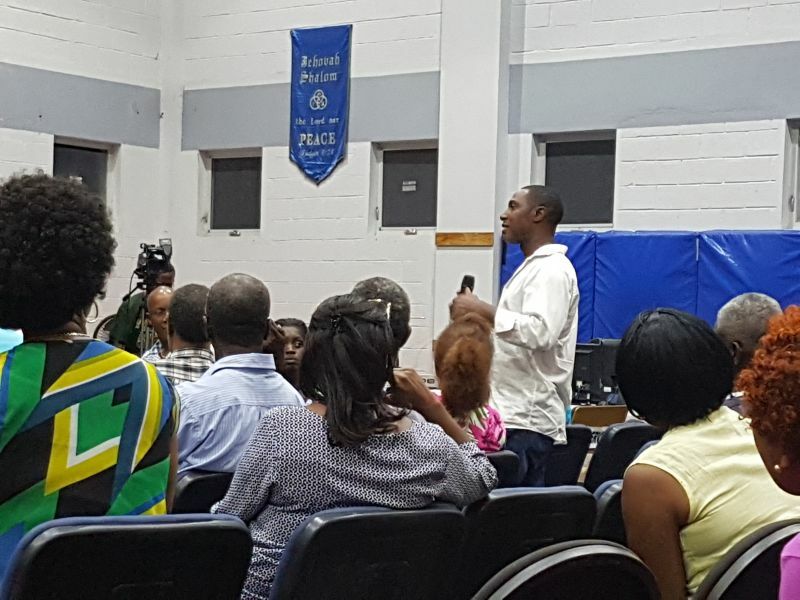 A resident at the meeting, who said he was a property consultant, had earlier stated that "ignorance" is one of the main reasons for many of the problems now faced by residents. He said people, mainly because of ignorance, have not been asking the insurance companies the right questions when buying insurance. He also advised that properties be re-evaluated every year. One woman said her home was badly damaged and while she was deemed under-insured the insurance was still not coming forward with a favourable figure as they were only proposing 1/3 of her insurance, lamenting that "I can't do anything with that" due to the cost of materials, adding that she is desperate to make her home livable again. Mr Fusco encouraged persons with similar problems to not give up and to consistently fight for every dollar due to them; however, he urged them to do it respectfully and with a smile. It was noted too by the private adjuster that the recent hurricanes have been a learning experience for both insurance companies and their clients. Going forward, Mr Fusco advice persons to buy Blanket Policies for an agreed value and, rather than insure for 100%, to insure to just 80%. Noting too that he was not there to solicit customers but to help them to hopefully approach the insurance companies in a more informed manner. Mr Fusco did say; however, that his company, World Claim, would assist once persons feel their service would still be needed. He said World Claim never charges more than 10% of claims successfully made. Caribbean insurance been delivering good on their promise. I Got my check a Month after I carrying my estitame. To think of all the estimates they had to look at that was good. i was very happy and pleased. Let's hear cline now!!!!! Then let have a chat about the port authority money??? Under informed?/!@#. Hmm. They need some serious regulating to operate in the Virgin Islands. You cannot give your MORE to receive your LESS. While I understand the need for us to blame someone, we must remember that its not just the insurance companies that may be at fault. What about the Banks? They too have a responsibility to make sure that their customers who have mortgages insure their properties properly. You cant have a house valued at $700,000 with a mortgage of $100,000 and have the customer insure the property for only the loan amount $100,00). That is unacceptable. The property is underinsured if something happens hurricane, earthquake, flood or whatever the property is underinsured. So please don't just focus on the insurance companies blame the banks also. Lastly we need to do what is best for the customer, here we have two sets of professional organizations that are allowing persons to underinsure their properties for their own gain....where are the laws? Both the banks that allows their customers to underinsure their properties and the insurance companies that sold the insurance to the customers need to find a remedy to assist the customers who have this problem. And I don't mean give them another loan and charge them interest! That makes no sense at all. Why would you charge banks and insurance companies with an obligation to make sure that persons insure their own things beyond what they choose to or are required to as a condition of the loan? If you are talking about mandatory insurance, only the government could regulate that. And then if you are going to do that you may as well have everyone pay into a fund held by the government to cover disasters. But some people might wonder whether the government could be trusted to keep such funds set aside. I agree with you 100!!! A scheme on the backs of The poor. House underinsured so What next? Taking out a second loan so that the banks make more money? Total Bullsh..t . Ignorance!! people have not been asking insurance companies the right questions. The nerve of these people if the insurance companies how they are operating now were medical doctors they would be sued for mal practice. The people were deceived. Whenever deceit is uncovered it is always the norm for the deceiver to make the victim look stupid and its there fault. We are not just talking about the uneducated man on the street but Doctors, Lawyers, Business people who built from nothing who have masters degrees are all victims to the insurance folly and misinformation. This is the first major storm to hit these islands since insurance came to these islands. The companies and the banks are behaving like only the people owe them something and not that they too owe the people. But we will see what the Government and the FSC will do in coming months good I hope. Insurance companies , Banks you all are playing with peoples lives and future. if they had to hold a Town Hall to state you not getting the screws uou getting SCREWED. @wize up you make perfect sense! 1. Most didn't understand what their policy coverage entailed. 2. It was the insurance company's job to make sure their clients truly understood what kind of coverage they were getting for their premiums. Some agents didn't fully understand what they were selling the client themselves or the implications. 3. Some truly could not afford the premiums to cover the full value of their home that they built cash out of pocket over the years or homes they inherited. 4. Real estate Appraisers and expat realtors in the BVI have significantly undervalued traditional local/native communities. Now the chickens are coming home to roost as all have to pay the same price for the same goods to repair their homes. So the under valued appraisals impacted the insurance coverage. This is an issue the government needs to address moving forward. 5. Some people who could afford it and understood what they were purchasing willfully took the cheap route out and didn't insure their homes for the appropriate replacement cost...I spoke to at least one or two about this and they fluffed it off. 6. People should build smaller in the future so they can afford full coverage without wrecking their financial plans. Stop trying to out do one another and live below your means. 7. The next storm waiting is some of those expensive universal life insurance plan agents sold to locals, they could have gotten better plans shopping around and putting the premiums they saved towards better coverage on their home. IT IS HARD HAVING THESE CONVERSATIONS WITH BVISLANDERS. THEY DON'T respect or believe their own who have the knowledge to help them. They always take the cheap way out unless it is designer hand bag or clothing that they can be seen in. 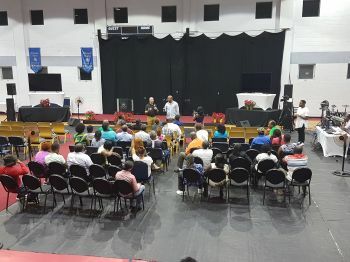 As a BVIslander I threw my hands up and decided not to open my financial planning practice on Tortola, it was too much of a tough sell, but the folks readily listened to others of different hue who swindled their money out of them. I cry now for the situation my people are in. Property insurance like other insurances’ goal is to maximize collection and minimize payout; typically, they (some) look for reasons not to pay out. Insurance executives will disagree with this view. Nonetheless, insurance companies should not shoulder the total blame for the current disagreement/friction. Customers need to be knowledgeable about the contract they are signing; read the annoying fine print. Specifically, they need to know the if they experienced a covered loss, how much will the insurance company pay out. If they are under insured, the insurance company will not cover the total lost. Think there is a general practice that in order to be paid fully for a covered loss, the property must be insured for at least 80% of the replacement value. For example, if the replacement cost of a property is $500K and if the property is insured for $300K and if a $250K lost is incurred, the insurance company may only payout $187.5K. Why? This is because the property was insured for $300K, not the $400K minimum consistent with the 80% practice. If the property were insured for $400K, the property owner would have received the full $250K for the covered loss. Instead,the property owner only received a proportionate amount of the covered loss (300/400x250). The 80% rule is typical but may/may not apply in the BVI. If no how is being under insured ascertained? Moreover, insurance companies must be in the forefront to educate customers on the negative consequences of under insuring their property(s) Further, if the replacement value of a property is $500K and the owner has a $100K mortgage on the property and insures it only for $100K, the insurance company may only cover losses up to $100K; the property owner is self-insured for $400K. What can be done to improve insurance companies and customers relationship? The following are some suggestions 1) establish a consumer protection agency, 2) create an insurance commissioner position as the insurance watch dog, 2) offer basic insurance workshops at HLSCC, 4) customer seek out an advocate to represent them when purchasing insurance, if needed, 5)banks as part of the terms and conditions of awarding a mortgage should encourage/require mortgagee to insure property for at least 80% of replacement value, 6)construction cost goes up so the replacement value and insurance should be adjusted periodicall, 7) insurance companies must be responsive and payout claims as quickly and 8) insurance set a target response time to respond to claims. Some may see insurance as legal thievery but insurance companies provide a valuable service. Insurance in essence is customers pooling resources to share covered losses. Nonetheless, currently some insurance companies have a tarnished image problem that they need to turn around. True, Hurricanes Irma and Maria may result in big payout for insurance companies. But that is way the ball bounces. Some years very little is paid out and in other years payout can put companies at the brink. Make the consumer whole! Class Mate, thanks for information on how under insurance works and how to avoid it. There was some talk about this with my insurer but it was not clear. It is clearer now. Let me see if I got it. In order to collect for damages up to the maximum insured value, the property has to be insured for at lease 80% of replacement value. Did I get it? You should have submit blog as a commentary. Boy, look like you mash on some corns. Of course, insurance is a rip off. Major Bay Primary in the house. Teacher Mac (MacField Malone) strap in hand must be smiling. RIP, olde boy. Lol! I like your comment Leonard, but the true goal of insurance is "Pure Risk" mitigation; that is to protect against financial loss. That is why the banks require it also. Having insurance transfers and shares loss. On your definition that is every for profit business goal..maximize revenue and reduce cost. @Me, thanks for the feedback. Clearly some clarifications are needed on the frequency of partial losses, insurance payout for covered losses, and co-insurance/under insurance. Insurance payout for covered losses: insurance companies will only pay up to the maximum value for which a property is insured, ie, replacement value or cash value. Guranteed replacement contracts are not common place anymore. Partial losses: Generally, most losses incurred are partial losses, not total losses. Consequently, due to the low probability of experiencing a total loss, property owners may take on more risk by insuring for less than the full replacement value. Thus, to provide lower premiums yet provide insurance protection, coinsurance/under insurance/insurance to replacement value clause is inserted in many contracts. Simply, for partial losses to be funded at a 100%, the property must be insured for at least 80% of the replacement value. For example, if the full replacement value of a property is $500K and it is insured for $300K, the minimum insurance needed is $400K (0.8x500=400) to avoid being under insured. Further, let’s say an insured peril, ie, a fire caused $250K in damages to a property. The insurance company will pay the property owner $156.26K, though the loss is less than $300K; there is a penalty for under insurance. How was this figure derived? It is loss incurred divided by 80% of replacement value times the loss (250/400x250=$156.25K). On the other hand, if the property was insured for at least $400K, the $250K loss would have been 100% covered. On another note, there is a difference between market value and replacement. Happy holidays! Correction......The payout by insurance company should be $187.5K, not $156.25K. The formula should have been the insured value divided by the minimum insurance value times the loss (300/400x250=$187.50K). The coinsurance penalty is 25%; the insured still ends getting paid less the $250K loss. @E. Leonard, are you telling me that unless I ensure my house for at least 80% of the replacement value I cannot collect a 100% for an incurred loss(s)? Is this why the insurance companies are only paying out a measly sum that is less than the estimate? So it took a major hurricane disaster for us to learn a costly, stressful and hidden lesson on property insurance. Can you list some basic questions that we should ask insurance companies. See you about Town for a glass of mauby. Lol. Disclaimer: The information provided below on typical questions to ask insurance agents is from a layperson, not an insurance expert perspective. Here are some questions that I would ask an insurance agent(s). They are not in priority order. 1. What does the policy cover or not cover? More importantly what is not covered. 2. How are claims filed and processed? What is the target response time on claims? 3. What is the minimum coverage needed to avoid being under insured? 4. What is the minimum coinsurance needed for a 100% reimbursement on partial losses, ie , 80, 90%......etc of replacement value? 5. What is the cost of the policy? How can cost be lowered and attain adequate coverage? 6. What causes premiums to go up? Will filing a claim cause premiums to automatically go up? 7. How are rates determined? What about the adjusters knocking. Down peoples quotes? How is the average person able to combat their clever little expert dance? If a lot of people come up short on replacing what hey lost then he BVI is in a hole. We need free expert advice on how counter these disgusting offers. @Me, “Insurance policies are based on 100% replacement cost but some companies was fooling their clients that they can insure for 80% without penalties.” insurance companies were not fooling their clients. Insurance to replacement value or coinsurance is a common practice in property insurance. Typically, the minimum coinsurance is 80% of the replacement value. Look like a perfect storm have hit insurance customers. First Hurricanes Irma and Maria slammed into the VI damaging thousands of properties. Secondly, leaving many displaced from their homes. Third, insurance companies are slow in processing claims. And fourth, finding out that they are underinsured. A house is a major investment for many home owners; it needs to be protected with adequate property insurance. Underinsurance is a major risk for home owners and could result in major financial loss with damages to their property. Hurricane Irma and Maria have exposed the consequences of underinsurance. Many property owners due to insufficient insurance may not be able to afford the thousands of dollars that they have to come out of pocket for. Property owners need to be educated on the adverse effects of underinsurance. Insurance companies need to take the lead to ensure customers are well-informed on the basic principles of insurance, especially property insurance. Nevertheless, property owners also need to educate themselves. There were two hurricanes we should have put in an estimate for intact three. 1 for flood August, 1 for Irma and one for maria. Insurance fool us but they taking out two deductables by disguising it saying we under insured. Tricks they already know how much they want to pay us from time they get estimate. Insurance trickier they play with your mind to get what they want. One good one so far. I believe this company didn't do enough to educate workers and clients. Was too busy making money,trying to see who get the most customersand forgot the real issues of their product. @Truth, the 07 August flood, Hurricane Irma (06 September) and Hurricane Maria (20 September) though they occurred close together were separate events and seperate claims need to be filed for each. If the insured does not want to be given a 6 for a 9, they need to educate themselves. Agree that insurance companies need to do more to educate customers. But why should they? It is a small market with limited competition and an inattentive/not to be bothered government. Government needs to set the framework and provide the strong oversight to ensure that customers are being treated fairly and are made whole in a timely manner. Insurance is shared risk; perhaps, the BVI and other regional countries need to join forces for a larger risk pool and lower premiums..
Full marks to Caribbean Insurers, who have been sending me my premium renewal notice with a cover letter asking me to consider whether or not I am under insured for years.